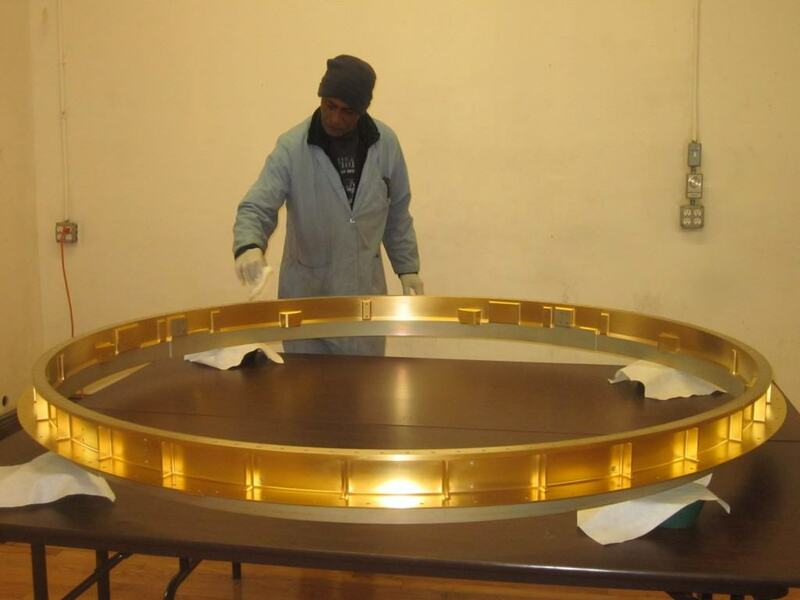 MMS Mission - EPNER TECHNOLOGY INC.
One of Epner Technology’s master platers inspects the MMS structure ring prior to shipping to NASA. Emissivity on a rough machine rings such as this, was less than .05. On a highly polished surface, emissivities below .02 are routinely achieved at Epner technology. This extraordinarily low emissivity capability was instrumental in Laser Gold being specified on 16 foot long stainless tubes that carry helium at a temperature of 6° Kelvin to cool the James Webb Space Telescope’s camera. 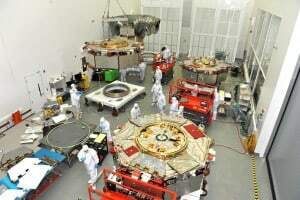 NASA specified Laser Gold as the low emissivity coating for four 2 meter diameter aluminum structure rings for the MMS mission. The ring is clearly visible in the first photo of the “stack” buildup of the four satellites to be carried aloft on this spacecraft. The rings were machined utilizing the large part capability of one of the most renowned machine shops in the country; Bechdon Machine in Maryland. The completed stack ready for launch. Epner’s contribution to the MMS process proved to be critical. Epner’s undertaking was to coat the “heart” of the Electrostatic analyzer, which filters out electron particles, specifically with Laser Black, which in the end met and even exceeded initial expectations by the MMS project team. For more information on this fascinating project, click on the link below.